Heritage HS., Leesburg, VA: On Saturday February 9th the Falcons competed in the 4A Region C Championship and again rolled through the field to capture the 2019 Championship. If the NW District was suspenseful for you, then I bet the Regionals must had you in that same riveting state. “You come to Fauquier you WIN Titles!" coach Tyler Atwell tells the Fauquier parents shortly after winning the 2019 Region C Championship. In some sense coach Atwell is right. Since 2010 the Falcons have won EIGHT Regional Championships. Again, must go out on a limb and say Fauquier wrestling now holds the most Region Champions by any sport program in Fauquier County. And in those other years, team Fauquier was Runner-up (2017, 2014, 2009, and 2008). That’s 12 years consistently being one of the top two teams in the region. Holding the Regional trophy and addressing the troops, head coach Doug Fisher’s first words were, “This is the most enjoyable team title that I ever won. Total team effort! I am so proud of everyone." You got to feel the enjoyment as every Fauquier wrestler departed Heritage HS on Saturday with hardware. Yes, all 12 participants placed top five in the 2019 Championships. After five hours of wrestling and the Championship 3rd and 5th placements rounds were about to begin, team Fauquier rested with a 1-point advantage over the cross-county rivals Liberty. 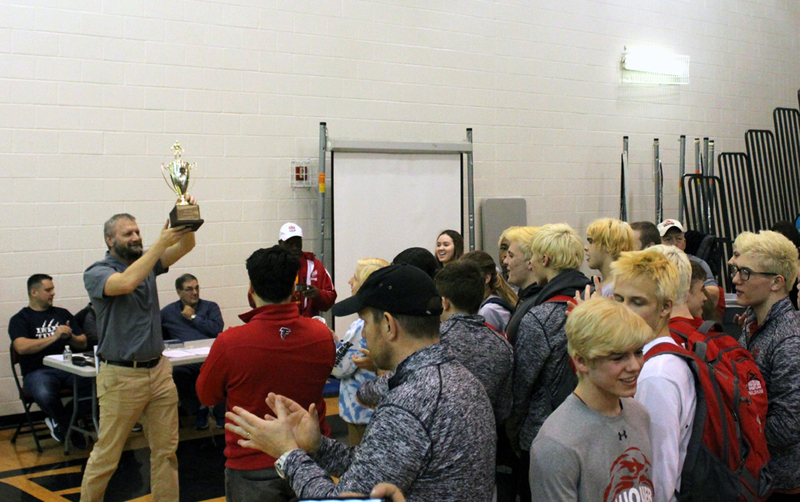 With seven Fauquier wrestlers on deck to Liberty’s three in the Consolation Final round, team Fauquier had to show strength if they were going to once again earn the Championship Title in 2019 and that’s exactly what the Falcons did. The Falcons proceeded to tally five pins in seven matches running the table by going 7-0. Fauquier extend the point spread to a 19-point lead going into the Championship finals. More on these seven matches to comes. In 2011 Fauquier’s second Region Championship, they placed and advanced 11 wrestlers onto the AA State Championships but fell short of having any 5th placers. 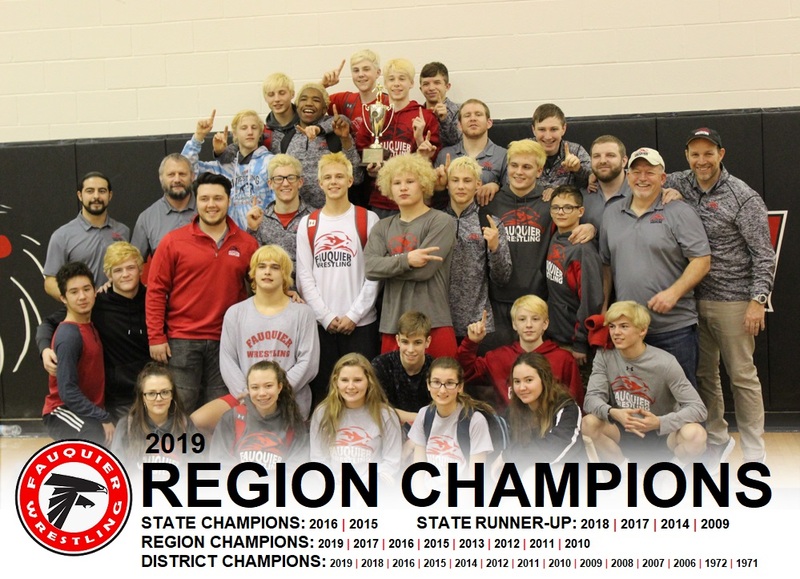 The 2019 team may go down as having the most region placers in history. Team Fauquier goes 8-4 in the opening round with seven pins as they advanced eight wrestlers to the Semi-Finals. Falls came from 132 Gino Camarca, 145 Eric DeWald, 160 Darryl Mayfield, 170 Kevin McEachin, 182 Sam Fisher, 195 Ben Bell, and 285 Thomas Heisler. As Liberty HS. entered the Region with nine wrestlers they also came out of the gate strong by winning all nine matches. Fauquier would currently rest in second place with 54 points behind Liberty with 61 points. If you want to punch your ticket to the 4A States, the Semi-Finals round is where you can do it. The Falcons went 5-3 in the Semi-Final round earning bonus points in two matches. While Fauquier would advance five finalists to Liberty six, both schools were tied for first place with 135 points. As 170 lbs Kevin McEachin and 182 lbs Sam Fisher received falls the important victory came from 160 lbs Darrly Mayfield with a 3-2 decision over Caleb Swinson - Liberty. While Fauquier would have seven wrestlers on deck in this consolation round Liberty had three. The odds were favoring Falcons but it was uncertain if the falcons could bounce back with individual victories. 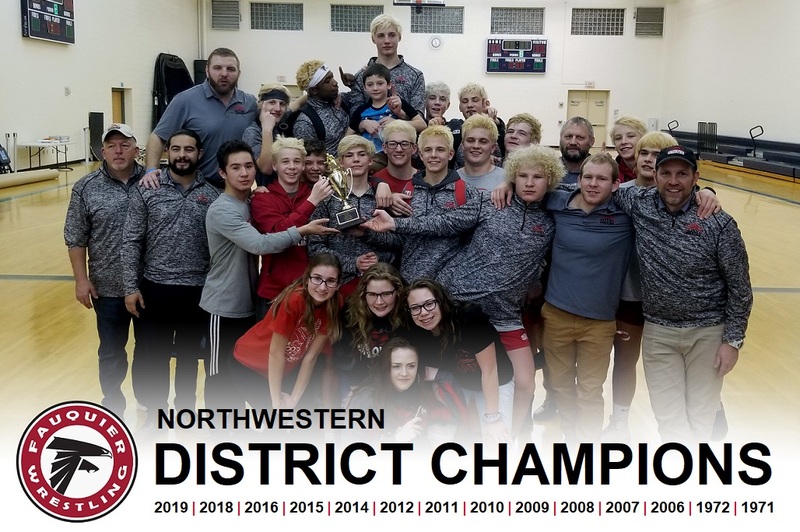 You must point back to the NW District and team Fauquier advancing 12 wrestlers onto regionals to be in this position to win the regions and the reasons they had a lead over the field. Below I highlight these seven victories in this consolation final round as one of the keys to bringing home the Region Championship. 113 - Reece Kuhns scored first with a first period takedown in the first period. Scoring a reversal and going up 4 points in the 2nd Kuhns finished with a near fall to win an 8-4 decision over Patrick Smith of Heritage. Kuhns would take 5th place as this win would give the Falcons + 2 team points with 151 points, 3-point lead over Liberty. 120 - Nolan McEachin - as the score was tied going into the 2nd period McEachin recorded a fall over Chase Arnstad from Riverside 58 seconds in the second period. An amazing come from behind 5th place win for McEachin and extended the lead to 155 points. 132 - Gino Camarca won by fall over Christopher Nuss of James Wood. Losing to Nuss a week ago turned into a great win by Camarca. Gino Camarca would take 3rd place and has advanced onto the 4A States. 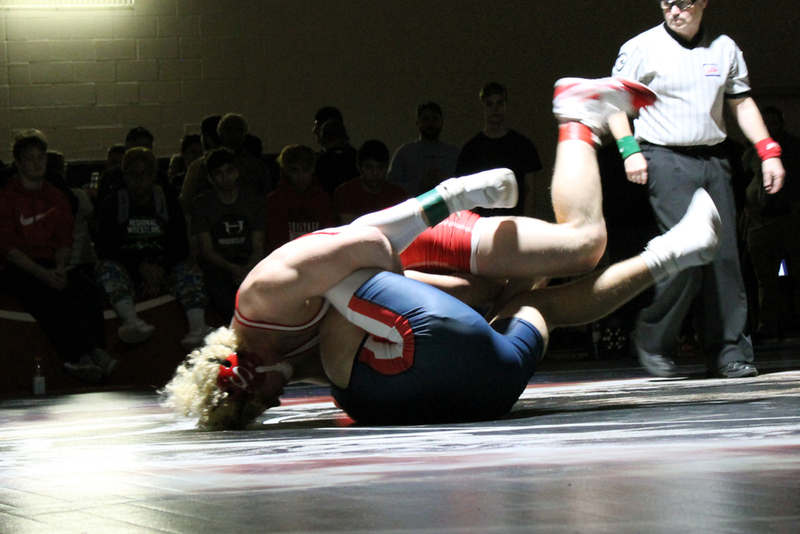 This pin also gave team Fauquier 4 points as they would rest with 159 points. 138 - Mitch Kuhns continued the pinning streak for the Falcons by also earning a fall in the 3rd period over Will Reed from Riverside. Mitch Kuhns would earn 5th place and improved the team score to 163 points as Fauquier would go up by 11 points. 152 - David DeWald also came out strong and recorded a fall in 44 seconds in the second period over Aiden Fitzwater of Woodgrove. David DeWald’s 5th place victory would now have team Fauquier at 167 points and a 15-point first place advantage. 220 - Casey Burr won by injury default over Charlie Salt from Loudoun Valley. Casey gave the Falcons + 4 team points and pushed the team score to 171 points. 285 - Thomas Heisler, the final Falcon on deck to wrestle, won a close 4-2 decision over Ivan Adams - Woodgrove. Heisler would take home a well-deserved 3rd place medal and would be a 4A State qualifier. Thomas Heisler’s victory would tack on +2 team points as the Falcons would rest with 173 points at the end of this round. Liberty earned 6 points in this consolation final round to improve to 154 points as they did not have the fire power to match Fauquier. Coach Tyler Atwell states, "I now have a whole new appreciation for the importance of the 5th place finals." Having five wrestlers in the 5th place finals earning team points is a key underscore for the team’s success and it showed with a 19-point lead heading into the Region Championship finals. Coach Thomas might have said it best, "Our guys did not give up on their teammates. Even after losing a match they were able to pick themselves up to help win the Championship for the team." Team Fauquier had five in the Championship Finals but Sam Fisher would be the lone Falcon to win an individual title. 182 – Sam Fisher once again dominated the first period and recorded a fall in the second period over Royce Hall – Liberty. This win improved team Fauquier to 179 points and sealed the Region Championship for team Fauquier. This is the third time Sam Fisher has won the Regions which puts him on a list with six other Falcons who are three-time winners. Fisher is on a similar path as Garrett Tingen who currently is the only three-time state champion. Fisher will battle next week for his third state individual title. Q: Taking 2nd in Regions last year, how sweet is it to bring the trophy back in 2019? Fisher: "It was the most rewarding title that I have experienced. It was a full team effort. Everyone scored points including bonus. Many of the guys on this team haven't been wrestling forever. They started in 8th 9th or even 10th grade like Tommy Heisler and they are having tremendous success as a result of their hard work and attitude. Our job as coaches is just to provide the best environment for these guys to succeed and winning the Region validates that we are providing that environment." Q: An exciting 3rd and 5th Finals, any reflections? Coach Fisher will be once again be gearing team Fauquier for the 4A States. 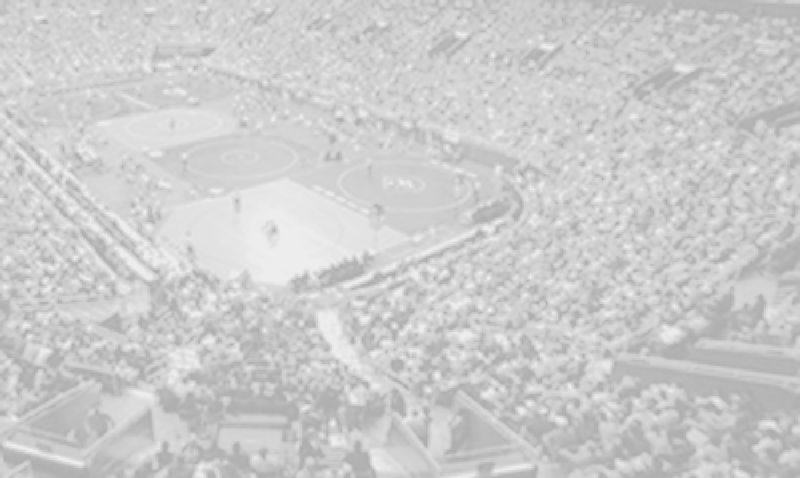 Each weight class will again be aligned into a 16-man bracket and the top 6 in each weight class will place. Fauquier Nation is making a late season surge as the stage is set for one more week of wrestling.